GRAPH: After a steep decline in 2009 due to signs of liquidity problems and the following upward correction RI now trades again below its IPO price. After initial market rumours ignited a slide in Raiffeisen International (RI), 70% owned by the Raiffeisen group, last week, panicking Raiffeisen executives worsened the situation, sending shares into a 30% tailspin within a week, erasing all 2010 gains. RI now trades below the original issue price around €40 five years ago. Chart courtesy of Vienna Stock Exchange. The managing boards of Raiffeisen Zentralbank Österreich AG (RZB) and Raiffeisen International Bank-Holding AG are currently taking a closer look at a possible merger of the two companies as one of several possible strategic options. However, no official decisions have been made to implement any of these strategic options. External consultants are also being involved in the analysis. A possible concept for the transaction would be that the business of RBG associated with the function of RZB as the controlling institution would be hived off from RZB into a new bank holding. As a result, this business area and the related equity holdings would not be the object of a possible merger according to this concept. Regardless of which type of transaction is chosen a stock listing would remain in place. A press conference on last Friday did not provide much more information but rather exposed that despite positive preliminary 2009 figures loan-loss provisions went stratopheric. Follow this link for a webcast of Raiffeisen's presentation, the Q&A session with 250 participants and a slideshow containing all relevant figures. Having seen more than €1 billion market capitalization evaporate within days Raiffeisen will go through a boardroom fight. RI CEO Herbert Stepic is also deputy CEO of RZB and it is both funding questions for Raiffeisen group and lingering massive writedowns in Eastern Europe that may become an important decision factor in the new executive board set-ups. RZB CEO Walter Rothensteiner is on the record with precluding a share issue in Austrian daily Der Standard in January. Austria's most powerful Raiffeisen actor, supervisory board leader Christian Konrad, usually not averse to media appearances - the Raiffeisen group owns or influences Austria's conservative media - has gone into hiding since shares started to slide. He now has to fight it out with regional Raiffeisen shareholders as his big dream of reconquering Central Eastern Europe (CEE) may turn into a nightmare shortly before his pension. Konrad has reached Austria's legal pension age of 65. To keep the unfolding story short it appears that Raiffeisen does not have any plans how to cope with its risky loan portfolio. RI was listed in 2005 for "strategic advantages." Current funding problems, Raiffeisen group also limps along with a crutch of €2.5 billion in public hybrid loans, obliging its management to hoist the storm jib as 2010 does not look any easier than 2009. The group has not yet decided on bonuses for 2009 after cancelling them a year earlier. Raiffeisen's sudden publication of 2009 figures preceded Erste Group's 2010 by a few hours. CEO Andreas Treichl reported a record operating profit of €3.77 billion Euros for 2009, an increase of 25% YOY. Erste is highly exposed to foreign markets in CEE. Less than 9% stem from its domestic business. Find Erste's recent data here (pdf). 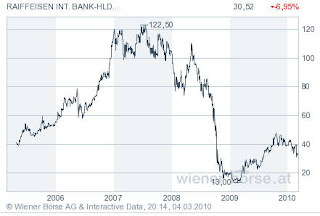 GRAPH: A 90% decline in Erste Group shares in 2007/8 based on fears about its exorbitat foreign exposure was immediately followed by a 500% jump last year, making it one of the best bank shares worldwide. Erste upped its loan-loss provisions by 92% to slightly more than €2 billion. An unchanged cash dividend of €0.65 per share demonstrates Erste's optimism to keep its head above water and outpaced Citigroups estimate from last November at €0.20. Check the press conference webcast plus slides on Erste's activities here. Its Czech subsidiary represents a very sizeable part of the Erste Group and its single most profitable asset has been doing quite well, but will cease to do so as soon as it is forced to realise losses on its real-estate related portfolio. Czech market observers point out though, that Erste entered the market much earlier than Raiffeisen, leaving the latter only the riskier parts of the business and see pain, but no fatality. Although hanging on a €1.224 billion public lifeline Erste considers reinstating bonuses after cancelling them for 2008 it was said at the press conference. As Austrian banks' activities in CEE literally fill volumes I refer you to this latest Erste Group research file on Austria and CEE (pdf). Nationalized Hypo Alpe Adria, where regulators try to find out where more than €3.5 billion went without much recording, made headlines again too. CEO for a mere 9 months, Franz Pinkl was allowed to go home with a €4.5 million public money handshake in a country where more than 15% of the population are in immediate danger of falling below the poverty line. Oesterreichische Volksbanken, in arrears with interest payments for public funds does not progress in its search for fresh and badly needed equity. 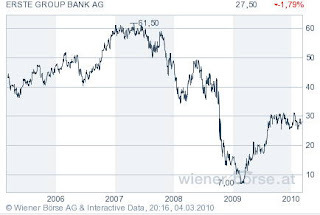 German 25% owner DG Bank indicated this week it would not provide fresh capital and one does not need to jump to conclusions that 6% shareholder Raiffeisen is not interested either in throwing good money after the bad. about increasing risks to the Romanian banking sector. This follows reports last week from both the Romanian central bank and commercial banks that bad loans are rising fairly sharply in Romania. The largest banks in Romania are Austrian and Greek-owned banks. The news flow concerning Romanian banking is clearly concerning and indicates that the bad loans have not peaked in South East Europe. Squashed by the explosive situation in CEE banks come under fire from many more sides. EU Commissioner Laszlo Andor attacked Austrian banks on Monday in Brussels, writes "Der Standard." "It is impossible that Austrian banks know nothing about the investment risk in the Balkan (countries...) If we now support the banks they have to give it back in better years." Andor supports ongoing fiscal stimuli through 2011, fearing a premature tightening of budgets may worsen the current fragile situation. Andor echoes ideas from Austrian social democrats who want to introduce a so far vague bank transaction tax that must not be passed on to customers. I may scratch my head whether this results in anything else than more additional administration when publicly supported banks pay an extra tax. Free markets - and with it free interest rates - would right excess leverage by itself. But as long as investors hang on to the ineffective market contortion by central banks and are willing to accept real negative interest it must be doubted that sanity is to be seen anytime soon. Banks have a big advantage in Austria. The current coalition is so busy with itself and coming regional elections that no action can be expected from the government. The recent Greek bond issue at 310 basis points over swap should be a loud wake-up call that investors have become risk aware and ailing Austria is on the fast-track to catch up on the economic downside. A coveted AAA rating and economic interconnectedness with Germany have made Austria's Federal Financing Agency's life fairly easy. A total debt of €169 billion cost an average yield of 4.20% in 2009 (2008: 4.3%) and Austria managed to issue a 16-year bond at yield of 4.85% in January. TABLE: Austria's economic think tanks forecast moderate growth in the year ahead, but as industrial production declined 10% in 2009 this country starts from a very low level. As always my main criticism focuses on artificially low-held consumer prices. Up goes, whatever is not in the basket. Unemployment figures have rushed from one high to the next in the running year. Politicians have so far done nothing else than to make more debts. Debt-to-GDP has rocketed above the 60% Maastricht threshold to 67% and new debts are budgeted to rise by 4.6% after 4.8% in 2009. In a selfish macro economic view Austria might be best off to come forward before being strangled by bond investors, traders and hedge funds. This is a small capital market that has become heavily overbanked and will not be able to evade what needs yet to be done in most parts of Europe. Banking has mushroomed on paper and after 2 decades of bubbles the downtime of the seemingly inevitable business cycle is nowhere from over. Off balance sheet risks are bigger than ever and could easily be the blow for mega-giga bankruptcy. As long as there is state capital involved - Austria's umbrella guaranty of €100 billion is close to 40% of GDP - transparency and prudence fittingly describe the style of banking a paying public wants to see. Tighter capital rules envisioned in the Basel III regulations are a looming next roadblock some players might crash into. The Austrian banking industry heftily opposes stricter rules as it would require another fresh €12 billion in equity to shore up institutions that face strong headwinds. Mind the capital gap.